Welcome back to another Disney Top 5. One would think that over the last ten years of writing this column that I've touched upon just about everything there is to talk about in Walt Disney World. The exact opposite is actually true. When it comes to Disney, there's a seemingly endless number of subjects to discuss and the countdowns are never ending. When I'm planning out articles, I typically start looking through the tons and tons of photos that I've taken over the years in the Disney parks and resorts for inspiration. This time, I came across a few photos from a trip to the All-Star Movies Resort last year and found what I was looking for. My muse came in the form of a 1963 Volkswagen Beetle named Herbie. I've always been a bit of a car lover, and the VW Beetle and the VW Microbus are my two favorite cars of all time. Once the kids are all done with college, if I'm able to treat myself to something, I'm pretty sure it's going to be a vintage Beetle or if I'm really lucky a mid 1960s to early 1970s bus. It's been a dream for a long time, and I hope I can finally have one in the garage one day. I had a really difficult time trying to determine if this is an actual truck or if it's just an Imagineering feat of construction. It's definitely got the front of an actual old truck and it certainly looks like a vehicle you'd possibly see in India. My best educated guess is the Imagineers took the front of a truck and built an ice cream stand onto it, all the while making it look just like an actual truck, but that's neither here nor there. The fact is, it's an awesome looking vehicle with more details and artwork on it than any other truck I've ever seen. 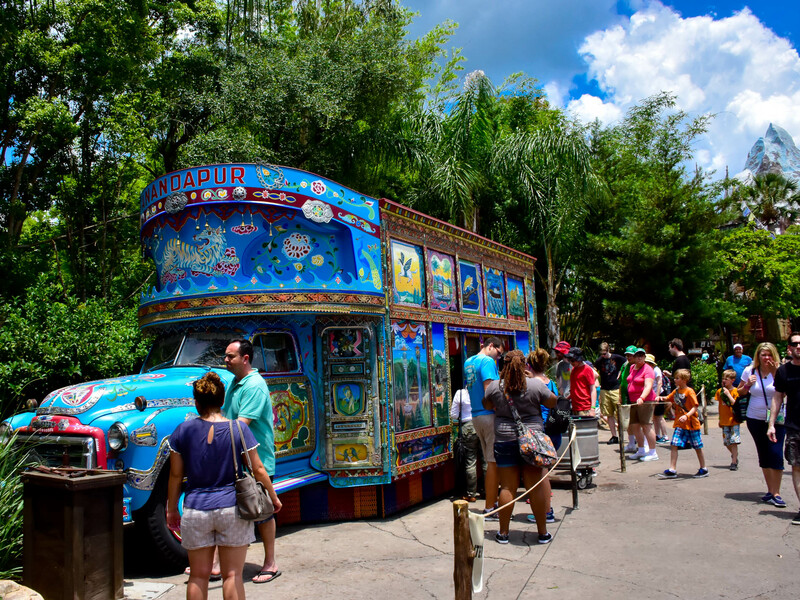 On your way to your Everest expedition, you can stop by the Anandapur Ice Cream Truck for a soft serve ice cream treat and admire this incredible vehicle. Photo by Bonnie Fink. I think I love this truck because it reminds me of one of my other passions, The Grateful Dead. All sorts of psychedelic school busses have been forever following my musical heroes around the country and I always love to walk around the parking lot and check out these unique works of art. This bus in the Asia section of Animal Kingdom may not be a hippie bus, but it sure reminds me of one. The details and the artwork adorning this vehicle are amazing. And how can you improve on the combination of my love of cars and my love of Disney? Make it a trifecta by adding ice cream! I have to admit, there's almost nothing cooler than these vintage cars that can drive on land and then drive right into the water without stopping or sinking. I haven't splurged for an Amphicar tour yet, and I'm not sure I'm going to, but the last time I was over in Disney Springs I was pretty psyched to see these vintage rarities motoring around. 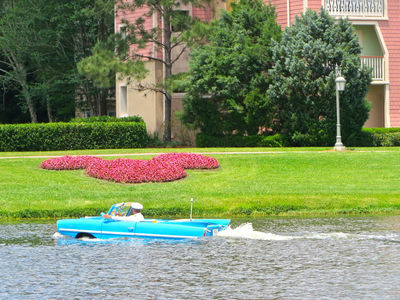 Amphicars tour Village Lake near Disney's Saratoga Springs Resort. Photo by Alan S. Dalinka. The even cooler thing is that these aren't Imagineering creations. These are actual amphibious cars from the 1960s that were purchased from private collections around the world. It's a pricey undertaking at $125 for a 20-minute tour, but it's way cool that these unique vehicles are being put into service on a daily basis down in Walt Disney World. If you're a vintage car fan, or just want to see something truly unique, stop in at the BOATHOUSE in Disney Springs and take a gander at something you definitely won't see anywhere else. According to the BOATHOUSE's literature there are less than 400 of these left in the world, and they've got a nice little fleet of them down there in Disney Springs. Disney's Hollywood Studios has always been a great place to spot some really cool cars: the gangster's car in The Great Movie Ride, one-of-a-kind vehicles featured in the old Stars and Motor Cars Parade, dining cars in the Sci-Fi Dine-In Theater, and "meeting" Lightning McQueen and Mater. Pairing Hollywood and cars has always made perfect sense. A majestic Cadillac rests off Sunset Boulevard. Photo by Chris Barry. My real favorites were always the vintage cars parked just off of Sunset Boulevard. They were there just to add color and to serve as yet another detail to make you feel like you were walking along a street in old-time Hollywood. I always loved the old Caddy, which greeted you just as you turned right onto Sunset off of Hollywood Boulevard. I'm not sure if it's still there or not, but in my opinion, it always should be. It's a true classic and helps with the immersion that the Imagineers were going for in Hollywood Studios. 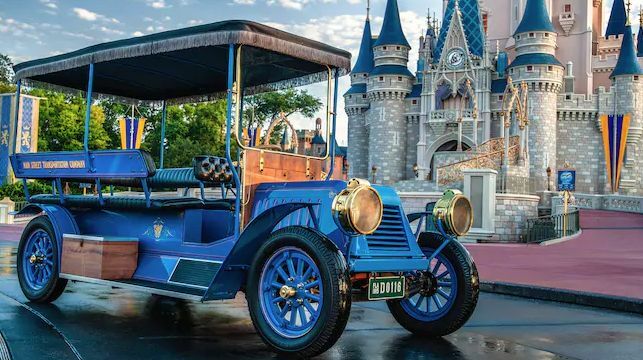 If you arrive at the Magic Kingdom early in the morning and don't rush off to one of the big attractions right away, you can partake in one of the all-time classic Disney attractions—The Main Street Vehicles. Take your pick of the fire engine, horse-pulled trolley, horseless carriage, or Omnibus and slip back into another era, and then slowly make your way down a turn-of-the-century American main street in a vehicle that more than likely at one point did just that. These vehicles have been in operation since opening day at the Magic Kingdom in 1971. It doesn't get more authentic than this. As I said above, it was Herbie that inspired this article and therefore, it's Herbie that lands in the number one spot. My wife has had two Volkswagens, one of them for the last 20 years, and it's still in our driveway and being driven almost daily. I drove my beloved 2003 Eurovan into the ground until it was totaled last year. I'm a big Volkswagen fan and was pretty thrilled that we were put into the Love Bug Building when I chaperoned a school trip to Disney last spring. I knew about the giant Herbie that made up the entranceway to one of the buildings, but I was surprised to see an actual Herbie sitting out in the courtyard. 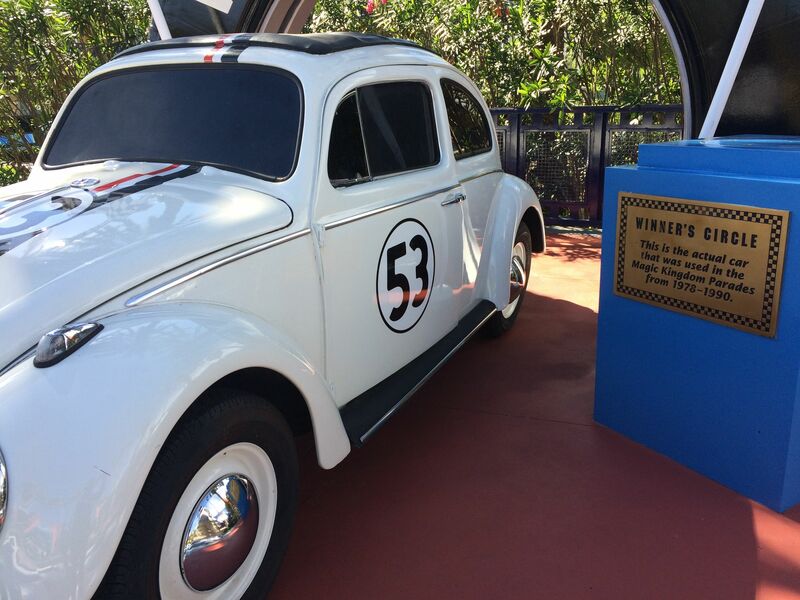 This is the Herbie that was used in Walt Disney World parades from the late 1970s through 1990. Photo by Chris Barry. The Herbie movies were huge for me when I was a kid. It's probably where my love of the VW Beetle stems from in the first place. So, to be able to walk right up to a beautiful vintage Love Bug right there at my hotel certainly put a smile on my face. Like I said above, there are plenty of cool cars to be found at Walt Disney World. I have to give the Honorable Mention slot to the Chevy Vega that the Imagineers somehow got way up into Spaceship Earth at Epcot. I've always wondered if it was brought up there as is or was it taken apart, re-assembled and placed outside the garage scene with the Steve Jobs-like character who's inventing the first personal computer. Either way, it's a treat to see it that deep inside an attraction. I realize that my choices are all vintage, and I suppose that makes sense. I've always said that if I had all the money in the world to buy cars, I would never buy a supercar like a Ferrari or a high-end luxury car like a Rolls Royce. Formula One race cars don't excite me. Driving a stock car at the old Richard Petty Driving Experience on Disney property never did that much for me either. I'm a much bigger fan of the older cars and I'd much rather have a few oldies in my garage than anything else. If I was able to, I'd probably buy myself a few of these cars on my list. How cool would it be to have your own Love Bug or an actual Amphicar that I could drive into the Long Island Sound or perhaps the ultimate Disney vehicle, the Main Street double decker Omnibus? It's probably not going to happen, but we Disney fans are dreamers, so I can dream about owning one of them, can't I? 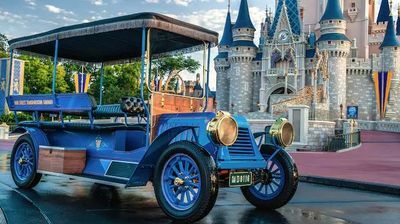 In the meantime, I'll drive our 20-year-old Jetta and our new SUV, and when I'm down at Disney, soaking up the usual magic, I'll be sure to soak up some of the classic car magic on property as well. That's all for this time. As always, I'd like to hear what you have to say. Click on the link below, let me hear your thoughts on my choices, let me hear your own and I'll see you next time with another Disney Top 5.